Careful readers may have noted that there haven't been any theme-meals lately to celebrate the babies' progress in growth relative to the size of various produce items. This isn't because of a lack of desire but rather because the scale has recently taken an unpredictable and seemingly inaccurate turn. The Bump's baby size chart took an odd turn saying that at week 22 they were the size of papayas and at week 23 they were the size of pomegranates. Remember that in week 20 they were the size of cantaloupes. I don't know about you but I've seen and eaten a lot of produce in my day but even the largest pomegranate I have ever encountered was smaller than the smallest cantaloupe. So it was that I decided to check out the BabyCenter.com but their chart just made things more annoying because at week 23 they said the babies were the size of mangoes and we already did mangoes in week 19! Some would argue that this is because the size is measured from crown to rump until week 21 when it's measured from head to toe. I think this is an extremely weak argument. We need a better baby-to-fruit comparison scale! So it was that I decided to take a little time off until these charts start making a little more sense. Jen has not had much in the way of cravings lately but this afternoon she developed a sudden and ravenous desire to consume Chipotle. 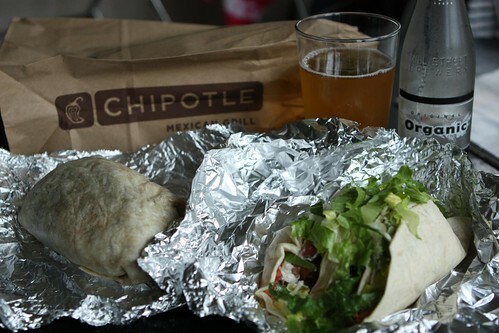 I've only ever been to Chipotle once in my life. Even Jen's cheapness sensible frugality knowing we had plenty of food already at home did not stop her from giving in and allowing me to bring her to Chipotle where we loaded up on burritos and tacos, an uncharacteristically heavy lunch for us both. Jen's tightwad nature sensibility did, however, allow her to advise against me getting a Negra Modelo which looked delightful sitting in their drink cooler. Given the amount of beer we had at home I could not disagree so instead I enjoyed another Organic Lager from Mill Street Brewing Company which was the closest thing we had to an appropriate Mexican lager. Given Jen's earlier bout with high blood pressure readings this week I did a little reading up on the matter. Through my research I discovered that foods high in potassium and calcium have the effect of lowering one's blood pressure. This may not be wise considering my already incredibly low blood pressure and that most doctor's are surprised that I am even conscious after taking my readings, however, one has to think of the mother and babies in this situation and put their own interests (and possibly life) on the back burner. With temperatures in the 80s today (and approaching 90 tomorrow) I thought it a fine opportunity to fire up the grill and even to eat outside, something we rarely get the chance to do, but since our super built a new patio, and invited us to use it, tonight seemed like the perfect night. As is often the case with the beginning of the grilling season I started by grilling a little too much so I grilled the kale before making it into salad. 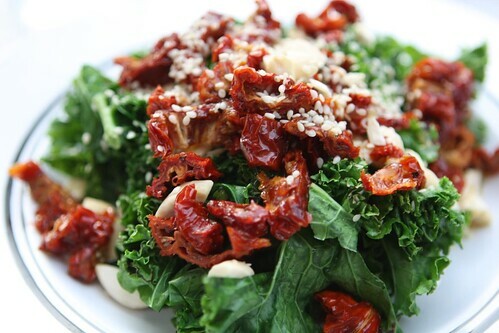 The salad consisted of grilled kale (190mg potassium per 100g, 134mg calcium per 100g) sun dried tomato (3400mg potassium per 100g, 109mg calcium per 100g), chopped almonds (266mg calcium per 100g), sesame seeds (919mg potassium per 100g) lemon, olive oil, salt, and pepper. 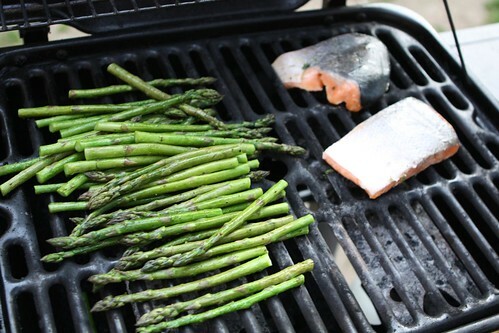 I started off by grilling some asparagus and salmon, however, as soon as the asparagus hit the grill the propane tank died. 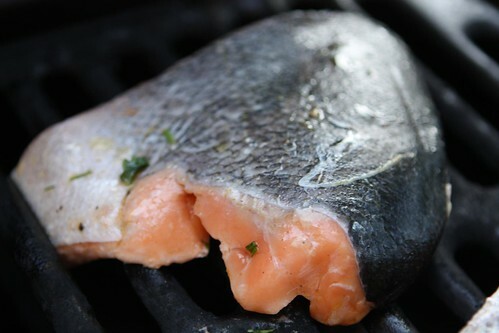 In desperation I threw some salmon onto the grill but, as you can see from this picture taken five minute later, the grill hadn't exactly retained enough heat to cook the fish through. 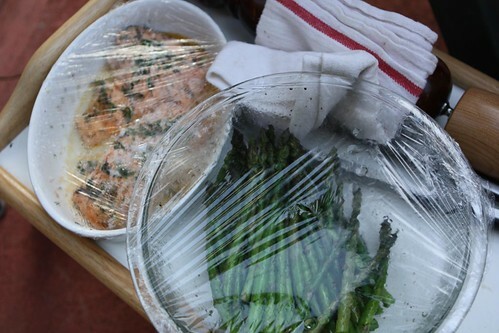 So it was that I had to run back inside to microwave the asparagus and salmon to finish them. This wasn't so bad as I have long maintained that microwaving is possibly one of the best ways to cook fish. That being said, the grill flavor wasn't quite as intense as I'd hoped for from this meal. 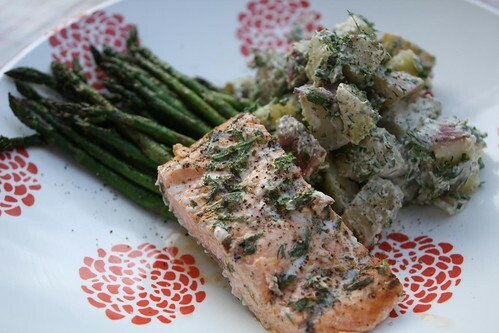 I served the "grilled" salmon (636mg of potassium per 100g) with the potato (535mg potassium per 100g) dill salad with chili powder (278mg of calcium per 100g) and smoked paprika (164mg potassium per 100g), some leftover buttermilk ranch dressing, salt, and pepper. There is a small amount of potassium, and a much smaller amount of calcium, in your average beer. However, I wasn't really intending this to be the most nutritious part of the meal. Besides, Jen isn't drinking so I was alone to reap all the nutritional benefits of the beverage. 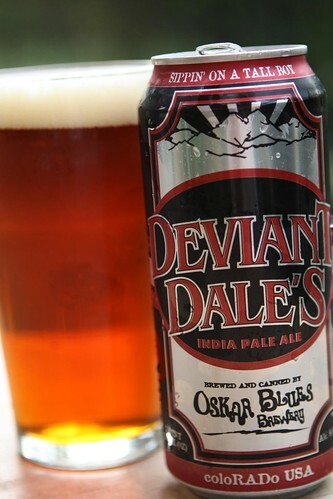 For beer I enjoyed this Deviant Dale's from Oskar Blues Brewery in Colorado. This was a beer that I probably would have hated a couple of years ago but I found myself loving it tonight. It had a slight oniony taste, almost like leek tops, from the hops. 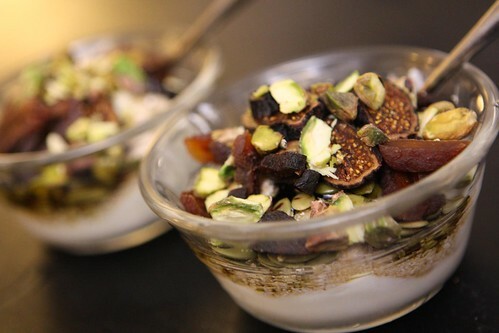 For a little dessert I made this yogurt (183mg calcium per 100g, 234mg potassium per 100g) with dried apricot (1500 mg potassium per 100g), dried figs (680mg potassium per 100g), oat bran (532mg potassium per 100g, 54mg calcium per 100g), pistachio (1000mg potassium per 100g), pumpkin seed (919mg potassium per 100g), flax seed (255mg calcium per 100g) pumpkin seed oil, honey, and a drizzle of molasses (1500mg potassium per 100g). After watching the Flyers and Penguins beat each other up all afternoon (while occasionally taking a break to play some hockey) we were tempted to go out for ice cream as is our NHL Playoff tradition but instead we left it at merely having this yogurt for a sweet treat at the end of the meal. There will be plenty more hockey, plenty more fighting, and plenty more opportunity for late night runs to Longford's. Well, until the babies are born. Then you will see a dramatic chance in the tone and pace of the blog entries. Just thinking about it makes . . . me . . . want . . .